Type 2 diabetes is associated with approximately a twofold increase in coronary heart disease (CHD) in men and a fourfold increase in women (1,2). Mortality from CHD in individuals with diabetes is also higher than in nondiabetic subjects (1–3). It has been thought that hyperglycemia is an important contributor to this risk. However, several studies have found no association between the degree of hyperglycemia and CHD or between duration of diabetes and CHD (4–6). Only recently, a modest association of glycohemoglobin levels and the duration of diabetes with the development of CHD was reported in two Finnish studies (7,8). 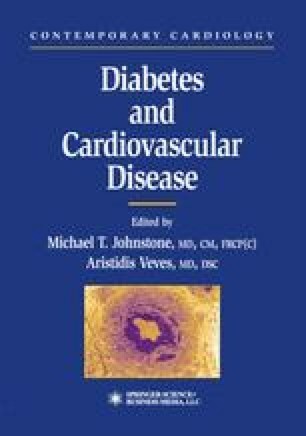 In addition, the recently completed United Kingdom Diabetes Prospective Study (UKPDS) showed that intensive diabetes management leading to improved glycemic control significantly improved microvascular end points, whereas the reduction in myocardial infarction rates (16%) failed to reach statistical significance (p = 0.052) (9). All these findings suggest that, as opposed to the clear influence of hyperglycemia in the development of microvascular complications in diabetes, hyperglycemia plays a weaker role in the development of macrovascular disease, in particular CHD. Thus, the risk for macrovascular disease in diabetes seems to rely to a considerable degree on other associated abnormalities such as hypertension, dyslipidemia, altered fibrinolysis, and obesity, all components of the insulin resistance syndrome (10,11). Since the insulin resistance syndrome is usually present before the development of diabetes, it follows that a significant contribution to the risk for cardiovascular disease in subjects with diabetes is established before the appearance of hyperglycemia.